This January, I find myself wanting to put citrus on everything. I already love squeezing lemon onto fish and chicken, grating lemon zest over salads, adding the juice to salad dressing. Its freshness and lightness makes me feel like spring might be right around the corner instead of the 5 months or so we have to wait - spring seems to come late in Colorado. After I made the Caramelized Banana Chocolate Chunk Frozen Yogurt, Jamie picked the next ice cream to make. Years ago, I bought a book of ice cream recipes, with the hope of someday making some of them (the "if-you-buy-the-book-the-ice-cream-maker-will-come" mentality). After flipping through the book, Jamie pointed to a recipe for Lime and Mascarpone Ice Cream, which sounded amazing. And it only called for 4 ingredients: lime juice, mascarpone cheese, powdered sugar and heavy cream. Between the mascarpone cheese and the heavy cream, it was a very rich and creamy ice cream. Although delicious! After mixing up the ice cream base, I wanted a lot more lime in it, so I added a bunch of zest. A little mint gave it a wonderful surprising zing also. Since it was so rich, I wouldn't make it with the heavy cream again, and have rewritten the recipe to use fat-free half 'n' half or 2% milk, but I've noted both variations below. 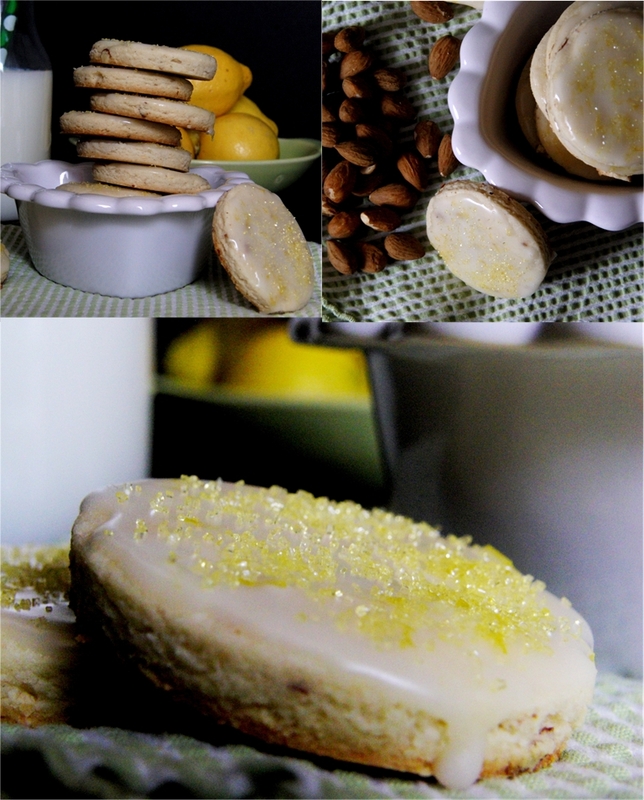 And for another citrusy treat, I made Almond Shortbread Cookies with a Lemon Glaze. Shortbread has a reputation of being very heavy on the butter and sugar - which, of course, is why it tastes so good (the basic shortbread formula is 1 part sugar, 2 parts butter, and 3 parts flour). 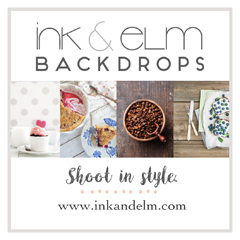 But I'm always looking for ways to lighten up recipes without sacrificing the flavor or texture. There's a triple dose of almond goodness in these cookies from almond flour, almond paste and chopped almonds. I substituted some of the white flour with finely ground almond flour (while being appalled at how much almond flour costs...) and some of the butter with almond paste (the gooey texture of the almond paste makes it an ideal substitute for butter in this recipe, and as a bonus, the fat in almond paste is only made up of less than 10% saturated fat, whereas butter is almost all saturated fat). Some chopped almonds for crunch. And since I didn't want these too sweet anyway, there's not an overload of sugar in them. Since I wanted to bake them immediately, I rolled the dough out between sheets of parchment paper, and cut them into small round cookies - after freezing for just a little bit, they baked up perfectly. The dough can also be rolled into logs, refrigerated overnight, and sliced and baked the next day. The brightness of the lemon glaze was the perfect finish to the cookies. This cookie recipe makes a lot of dough (I only used half of it and still got 30 cookies out of it), so if you don't want so many cookies, just use the rest of a dough in a pie plate or tart pan and bake a pie. How delicious would an almond shortbread crust be in a tart or pie? Cut the butter and almond paste into chunks, place in a bowl and freeze for about 30 minutes to thoroughly chill. In a large bowl (or a large food processor) combine the almond flour, all-purpose flour, powdered sugar and salt. Sprinkle the cold pieces of butter and almond paste over the flour. Use a pastry cutter (or pulse the food processor a few times) to incorporate the mixture - there should still be visible chunks of butter and almond paste, so don't over process. Sprinkle the ice water over the dough, a few teaspoons at a time, working it into the dough quickly so that your hands don't warm the dough too much. Once the dough holds together, neither too dry nor too sticky, sprinkle the chopped almonds over the dough and knead a few times to incorporate. Divide the dough into two equal pieces. If you want to bake cookies the next day, then roll each piece into a log, wrap tightly in plastic, and refrigerate overnight. The cookies can then be sliced and baked when you have time. Dough can also be kept in the freezer until ready to use. To bake cookies right away, flatten each half of the dough into a disk. Keep one out, and wrap the other in plastic and refrigerate until ready to use. Roll the dough out, between two pieces of parchment paper, to a 1/4 inch thickness. Use any shape/size cookie cutter (I used a simple 2-inch round cutter), to cut the cookies. Place 1 inch apart on a baking sheet lined with a silpat or parchment paper (I fit 15 cookies on each baking sheet). Roll out the scraps and repeat until all the dough is used up, trying not to overwork the dough. Set the baking sheets in the freezer for 30 minutes. Preheat the oven to 350. Bake the cookies (straight from the freezer) for 12 minutes, until pale golden. Cool for 1 minute on the baking sheet then transfer to a wire rack to cool completely. To glaze the cookies, whisk together the lemon zest and juice, corn syrup, milk and powdered sugar until smooth. 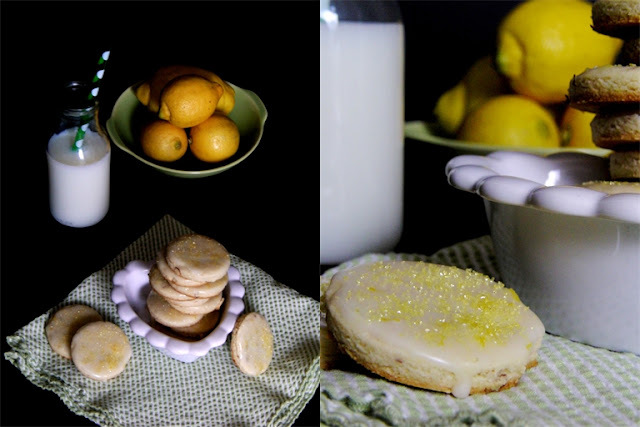 Use a small, silicone pastry brush to brush about a teaspoon of glaze over each cooled cookie. Sprinkle with sanding sugar before the glaze sets. Let sit for about an hour to completely set the glaze. Yields about 60 cookies, or 30 cookies, plus 1 tart/pie crust. Note, this is a large recipe, and can easily be cut in half, but almond paste comes in 8-ounce cans, which is why I wrote the recipe to use the entire amount of almond paste. Freeze according to your ice cream maker's instructions, (about 20 minutes of churning in a pre-frozen Kitchen Aid Ice Cream Maker attachment), then freeze in a container until firm, about 4-6 hours. 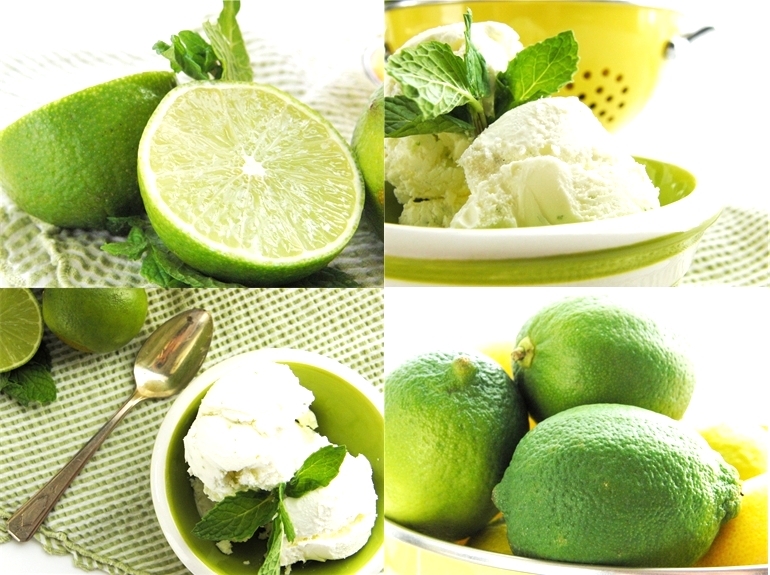 Adapted from Lime & Mascarpone Ice Cream, pg. 42, from Ice Cream: The Perfect Weekend Treat, by Susanna Tee.